I’m finding practicing Yoga daily to be not too much of a challenge, especially while remaining in the one location without too many distractions. During Week 2 I’ve started to incorporate arm balances into my Yoga sequence. Working on my Bakasana (Crow Pose) and side Crow again after a few months of not practicing. During Week 2 my Bakasanas are very shaky and I’ve had a few crash landings – but that’s half the fun. Although my daily Yoga is going well, it’s my Meditation practice that has been more difficult; I’ve missed 2 of the 7 Meditations for Week 2. On the other 5 days when I’ve managed a daily Meditation I’ve had a few days variation from practicing both the Guided and Mindfulness Meditations and just practiced the Guided Meditation. 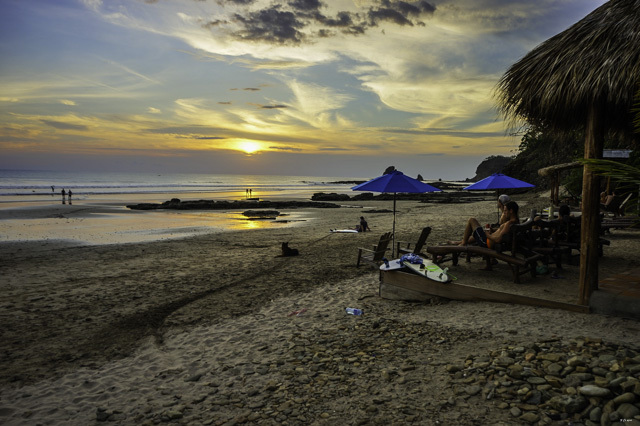 These have mostly on the days when I’ve had a day out – like day tripping to San Juan del Sur on Day 8. This has given me a little insight into how difficult keeping up a daily Yoga and Meditation practice can be while on the road. We’re off to Costa Rica in one week and I’m working on how I’ll be able to maintain my daily practice while in transit or exhausted from travelling. By the end of Week 2 I’ve realised that a morning practice combing Yoga, Meditation and a Savasana is working for me best at the moment. Today was the weekly trip back to San Juan del Sur for supplies. I decided to split my Yoga and Meditation at beginning and the end of the day. Practicing Yoga in the morning and then only doing only a Guided Meditation before bedtime. Very slow start today, I didn’t practice Yoga until in the mid-afternoon. I decided to leave the Meditation until the evening and I ended up practicing a Guided Meditation at bedtime. Today I practiced Yoga but no Meditation. After splitting the practices on Day 8 and Day 9 my intention was to practice Meditation in the evening, unfortunately it somehow never happened. On day 11 I practiced Yoga but no Meditation again today. My intention was to do a before bedtime mediation again but as I was drifting off to sleep I remembered that it never happened. I’ve recognised that splitting my Yoga and Meditation practice isn’t working for me. I’ve missed two days of Meditation trying before bedtime Meditation. Tomorrow I will try to do both the Yoga and Mediation practice together in the morning. Today I did my Yoga, Meditation practice and then a Savasana all in one sitting in the morning. I’m thinking that this daily routine in the morning could work better for me. Splitting my Yoga and Meditation practice wasn’t working. I’d end up think about needing to do my Meditation throughout the day – all the energy thinking about Meditating could have been better used just doing the Meditation! And I do like incorporating the Savasana at the end of my practice, it feels like more of a complete practice this way. Today I did my daily Yoga and Meditation practice in the morning again. Although I practiced after breakfast and I felt a little heavy and lethargic. So I slowed down the Vinyasa sequence I’ve been working through into a Vinyasa/Yin practice. I held each asana for a few more minutes than usual and worked into my muscles and ligaments and focused more on my body alignment. I also added the mindfulness Mediation to the Guided Mediation and ended with a Savasana (final relaxation). It has been very noisy at our bungalow with maintenance work happening throughout the days. It has definitely tested my concentration during Mediation. However, even with all the noise, I found practicing both the Yoga and the Meditation in one sitting easier than splitting the two. I feel that I’m getting closer to a daily Yoga and Meditation practice that could suit me – at least when I’m not in transit while travelling. I’m still thinking about how my daily practice will go when travelling down to Costa Rica and beyond. Wow – two weeks already! Today I continued to practice in the morning and combine Yoga, Meditation (Guided and Mindful) and then a Savasana as one practice. This routine seems to be working for me for now. It still continues to be very noisy with maintenance men working away throughout the day and throughout my practice. I’m learning to tune the noise out – it’s not always easy. I still find that my mind wanders during Meditation but I’m at peace with that – I just follow it wherever it goes and acknowledge the thought (sometime wondering why the hell am I thinking about that!?) and then back to my breath. I continue to work through my Vinyasa sequence, not a slow as yesterday but just at a leisurely pace. I added Bakasana (Crow Pose) today and it’s still pretty shaky, but I figure that I’ll get there with more practice.